University of Maine hockey players line up before a home game against Quinnipiac in Orono in this October 2016 file photo. The University of Maine men’s hockey team will be playing games on the other side of the Atlantic Ocean next season. On Friday afternoon, it was announced that coach Red Gendron’s Black Bears are among four teams playing in the 2017 Friendship Four tournament in Belfast, Northern Ireland. The tourney, which has been held since 2015, typically sends two Hockey East schools and two Eastern Collegiate Athletic Conference teams to Northern Ireland. 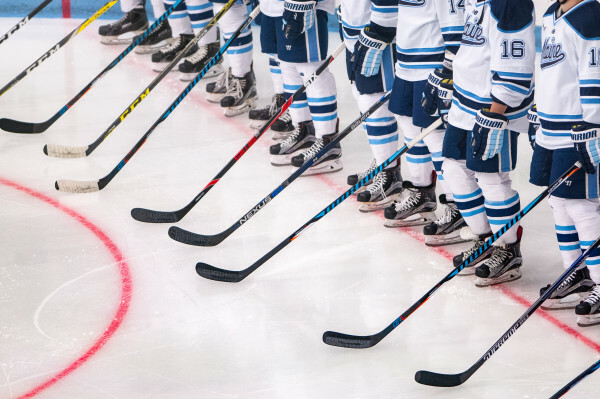 Providence College, Rensselaer Polytechnic Institute and Clarkson University will join UMaine in Belfast as tournament competitors. The 2017 and 2018 tourney teams (Yale, Union, Boston University, Connecticut) also were announced Friday by The Odyssey Trust, which owns the SSE Arena, where the tournament is played. The SSE Arena is home to the Stena Line Belfast Giants of the Elite Ice Hockey League. Former UMaine star Colin Shields currently plays for the Belfast Giants and has 12 goals and 11 assists in 23 games this season. He finished his Black Bear career (2001-2004) with 61 goals and 56 assists in 120 games. The tournament is traditionally held on Thanksgiving weekend. The 2016 field featured Vermont, Massachusetts, Quinnipiac and St. Lawrence, and the inaugural event showcased Brown, Colgate, Northeastern and UMass Lowell. The Black Bears will face Hockey East rival Providence in their first game and will be taking on either Clarkson or RPI in their second game. The 2015 tourney marked the first time an NCAA college hockey game was played outside of North America. “We are incredibly thankful to Northern Irish Connections, the Belfast City Council and its Sister City partnership, who will help to make the 2017 and 2018 events a huge success as well as a great boost to the local economy with a great deal of positive media coverage for Belfast from across the world,” Odyssey Trust Chairman Eric Porter said in a statement. “We want to make the Friendship Four in 2017 and 2018 open to all and we expect that the city of Belfast will, yet again, open its arms to our U.S. guests as well as be excited to see this standard of ice hockey return to their home arena again for two more years,” he said. The 2016 tourney attracted 22,000 fans over four days, with 70 television networks in the United States, Canada, United Kingdom and the Republic of Ireland showing the event. UMaine and Clarkson last met in 2012, and the Black Bears swept RPI in a series at Alfond Arena in October 2016.